Help your baby breathe easy and sleep soundly with the Motorola Smart Humidifier. 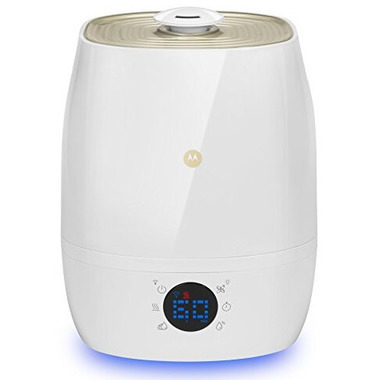 This connected humidifier can be controlled with the Hubble app for smartphones and tablets, or from the convenient LCD display. 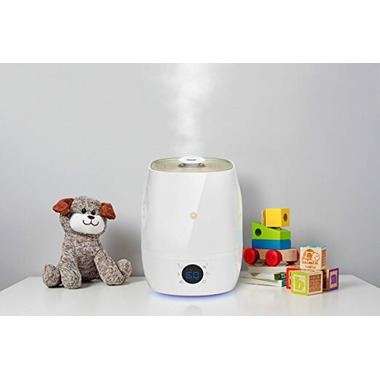 Choose from either warm or cool mist and 4 speed settings, giving your little one the perfect environment. And thanks to a humidistat that measures the humidity in the room, the Smart Humidifier can automatically maintain your desired humidity level. Soothe your child with the integrated night light, and help them breathe better with the air purification function. Plus, with a large 1.5 gallon water tank with up to 30 hours runtime, you can sleep soundly, too. With Motorola's Smart Humidifier, your nursery just got smarter. Great humidifier. Looks very nice in the room, and is easy to fill and use. Controls are simple enough, and I didn't find the need to connect to wifi.